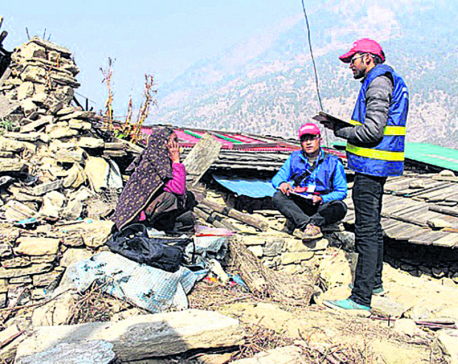 DHADING, Jan 26: The government's decision to provide addition of Rs 100,000 as quake reconstruction grant has brought happiness among earthquake victims who are struggling to rebuild their houses. Sita Gurung of Siddhalekh Rural Municipality-5 in Dhading district has completed laying the foundation of her house and applied for the second tranche of the grant. Although she started construction with the first tranche of Rs 50,000, Sita said the work could not move further due to rapid increase in the prices of construction materials. “In the past few months, the price of construction materials including rods and mud have increased. We are very happy with the government's decision to provide additional Rs 100,000 grant,” said Sita. Likewise, shortage of construction materials such as stones, mud, cements and timber have also contributed to the delay in reconstruction work in the district. Due to this, many have laid only the foundations of their houses and stopped the work. Quake victims said transportation of construction materials too are expensive as renting tractor trailers and trucks does not come cheap. Also, the government's decision to provide the grant on installment basis has prolonged the reconstruction process, they said. There are a total of 73,310 beneficiaries of quake reconstruction grant in the district. Of the total victims, 67,226 victims have received the first tranche and 17,581 have received the second tranche. Only 3,812 victims who signed agreement with the National Reconstruction Authority (NRA) have completed their house construction, according to Urban Development and Building Division Office of Dhading. Bhagawati Lamsal of Neelkantha Municipaliy-12 had received her first tranche [Rs 50,000] two years ago. However, after seeing that she cannot possibly reconstruct her home with that amount, she has been living in difficult conditions under a filmsy shelter. Only after the government announced to provide an additional Rs 100,000 for the grant did she made up her mind to lay the foundation. Lamsal said she did not give thought to reconstructing her home due to increase in the prices of construction materials. “We are now determined to construct our houses properly as the government decision has made this possible,” she added. The cabinet on Wednesday had decided to provide additional Rs 100,000 as the quake reconstruction grant. Before the decision, the total grant was Rs 300,000.